Make no mistake: This is a tough half marathon, but you will be well rewarded with some of the best views that Dartmoor has to offer. 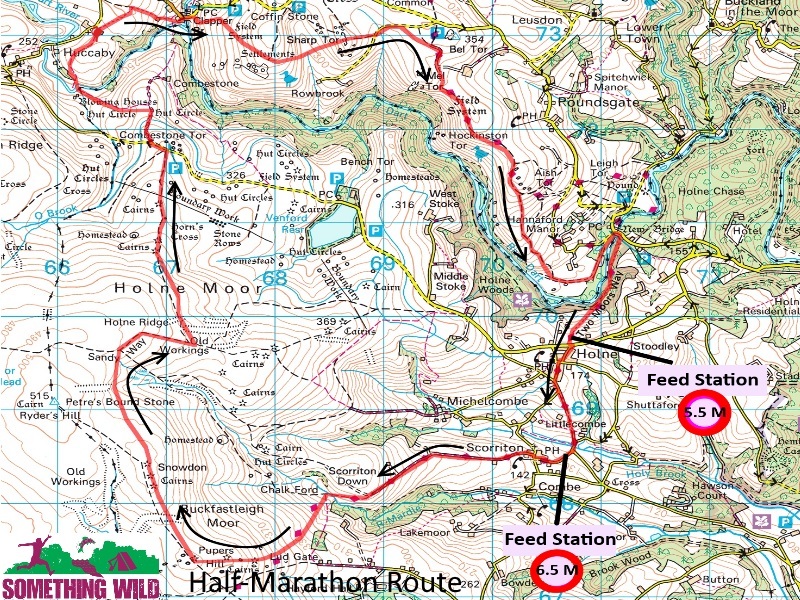 The route starts and ends at the festival site at Huccaby Farm, crossing the river at Dartmeet before climbing gradually to Sharp tor and along Dr Blackalls Drive to New Bridge, from where you will enter Holne Woods. Next you will cross through Holne and return via Holne ridge to Coombestone tor. You will still need your wits about you in the final furlong however, as another river crossing beckons, via the Huccaby stepping stones. You can add one or two nights camping with your booking. It includes entry to our Speaker’s Evening. Electronic chip timing + live results online. You can add festival tickets when you register. They include TWO nights camping, PLUS forest school entry for the family, a guided swim, a live band & FREE entry to the Speakers Evening. For people coming without children it’s TWO nights camping, a guided swim, a live band & FREE entry to the Speakers Evening. Here is a map of the half marathon route.